While HDR support for PC games and monitors produces more vibrant images, the HDR transport format often results in higher latency when PC gaming. To address the latency issue, AMD has introduced Radeon FreeSync 2, which lowers latency by switching the workload to Radeon’s powerful GPU, meaning you will be able to see the exact image pixels a monitor intends to display. The new API for FreeSync 2 lets games adjust the tone map according to the display’s target contrast, luminance, and color space. With the FreeSync 2 specification, you won’t need to tweak your monitor’s settings to get the best image quality. In short, it’s a bumped-up version for AMD’s display-syncing tech for gamers, adding support for a better and smoother picture to HDR monitors. The result is a brightness and color volume that’s more than double the brilliance of sRGB. AMD says all FreeSync 2 monitors will also have support for Low Framerate Compensation. “Radeon FreeSync 2 technology is the first of its kind that combines HDR support with dynamic refresh rate technology, and does it in a seamless, plug-and-play manner that improves gaming quality automatically when the right content is present,” said Scott Herkelman, vice president and general manager of gaming, Radeon Technologies Group at AMD. AMD intends for the new iteration of FreeSync to co-exist alongside the original specification. 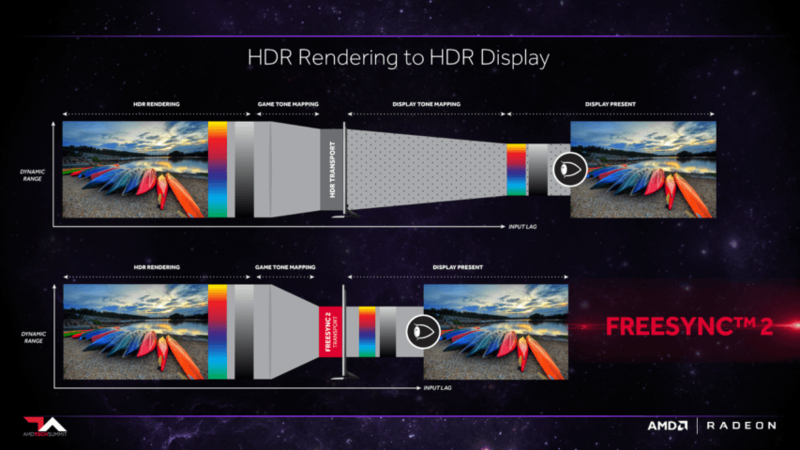 However, the company reserves the FreeSync 2 designation for premium displays with HDR support. Also, all Radeon graphics cards that already support FreeSync will be compatible with FreeSync 2 technology as well, including the Radeon RX series GPUs that uses Polaris architecture to support DisplayPort3 HBR3 and enable Ultra HD resolution beyond 60Hz. The FreeSync 2 specification will enable monitor manufacturers to produce higher-quality displays that leverage FreeSync technology. The plug-and-play technology will provide impressive color gamut and brightness compared to other monitors. FreeSync 2 will come to monitors built by various manufacturers in the first half of 2017.